This year I have been acutely aware of both the joy and sorrow that being a 'dog parent' can bring. In February, we lost Mina - the hound that started my love affair with dogs and the hound responsible for my change in career. In June, and completely unexpectedly, we welcomed a young greyhound puppy - Ava - into our home. 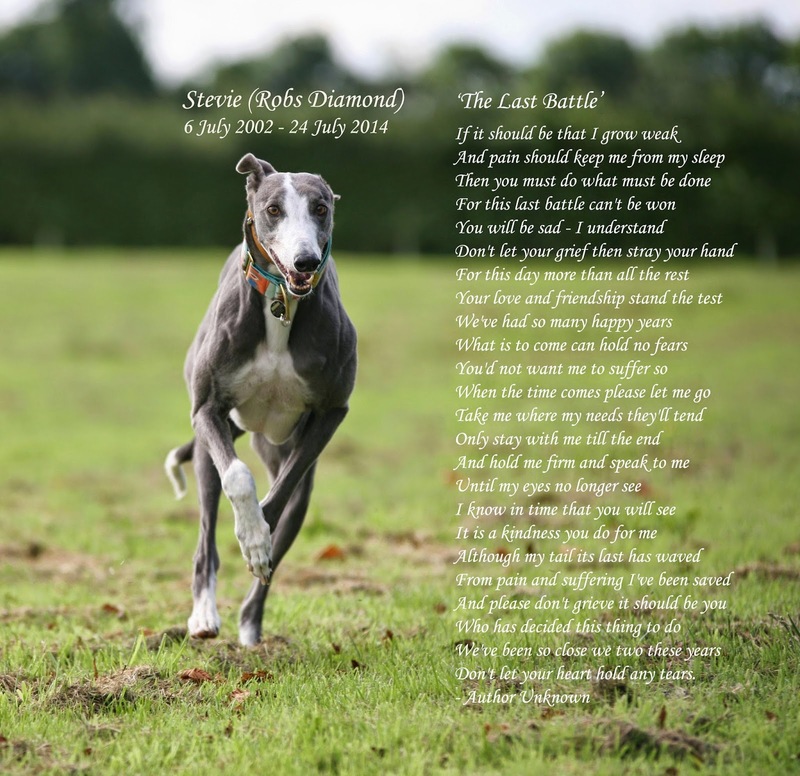 6½ weeks later, we said our final goodbyes to Stevie - our beautiful blue greyhound. Losing two hounds within 6 months of each other has been hard. It was particularly bittersweet to see Ava bloom whilst Stevie seemed to deteriorate before our eyes - a stark reminder of the relative brevity of our dogs' time with us. This got me thinking - what if our dogs could tell us how to be a good 'dog parent'? Wouldn't life be simpler then? I like to stop and sniff the 'pee mail', I might like to dig or chase things, I might like cuddles (or I might not) - provide me with a suitable outlet to do the things that dogs do and don't make me do things I don't like (not all dogs like cuddles). Remember, I am not trying to dominate you or become a 'pack leader' - I'm just a dog (for heaven's sake, I sniff butts to say 'hello' - definitely not a sign that I want to dominate you and take over the world)! I form strong social bonds with my 'parents' and will look to you for guidance. I expect you to keep me safe and away from harm, provide me with a comfortable bed, nice food and physical and mental stimulation and look after me if I'm ill. In return, you'll receive my love and the chance to see me develop into a well-mannered family pet. If I do something 'wrong' - don't punish me. I may not know your rules and I certainly don't know what's right & what's wrong. Rather than punish me, think about what you'd like me to do instead and teach me how to do it. If I jump up at visitors, teach me that sitting every time someone comes to the house, is more rewarding than jumping up. If I shred the post, install an external mailbox (I used to love to shred post and then my humans installed an external mail box...spoilsports!) and give me other stuff to shred or things to occupy me like a stuffed Kong. If you punish me, you'll only make me afraid of you and less likely to want to do things with you as you will become scary and unpredictable in my eyes. Our time with you humans is short. Don't hang onto or dwell upon past regrets, live in the now and fill life with positives. Stop to smell the flowers/coffee, read the newspaper (I'm told this is the human equivalent of checking pee-mail). Appreciate life as it happens and treasure your moments with your four-legged companion. Be patient and kind. I will have boundless energy and I'll be exploring the world I've arrived in. Guide me, teach me and show me how you want me to live with you. Don't keep saying 'no!' I don't really know what it means (I know some dogs who think their name is no) and just think you like giving me attention. Find a good puppy class to take me to. Make sure you socialise and habituate me to all the things I'm likely to encounter in life - pair them all with the good stuff (food) and I'll learn that all these new things I encounter, aren't scary at all. Provide me with safe outlets for my puppy exuberance... I will grow out of it, with your guidance. 6. Do things with me. Find out what my breed (or mix of breeds) was originally bred for. 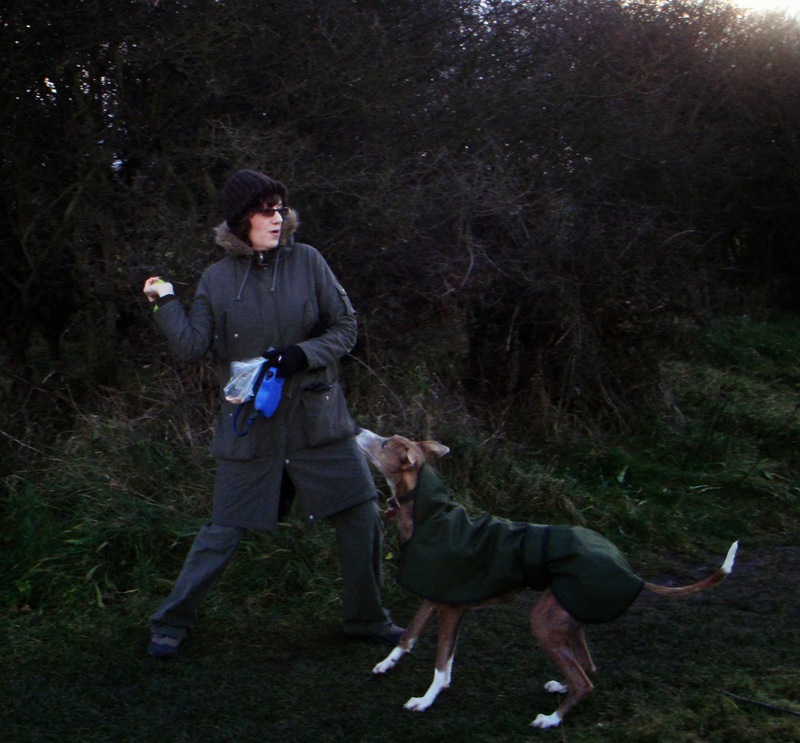 Us sighthounds love to chase fast moving objects - you can make things fun for both of us by playing with furry toys. Play scent games - did I tell you that my nose is amazing and can sniff out things you couldn't imagine? Don't think I'm untrainable or stubborn: I can't read and I don't know those words - they simply don't exist in my vocabulary. All dogs are trainable - after all, I learned to live with several cats and I spent most of my early life chasing furry things around a race-track! I also learned how to sit, would recall and loved scentwork - all things that (books say) greyhounds can't do! Don't let me suffer alone. My fears may not seem rational to you but contrary to popular belief, reassuring me won't make me more fearful. I hated fireworks and loud noises but they became more bearable when my humum was there. She provided me with a nice den, calming music and more - she helped make it less scary. It's true, patience is a virtue. If I don't 'get something' first time, I'm not being obstinate - take the time to teach me. Just like humans, not all dogs learn at the same rate and we can have 'off' days too. I'll need more of your patience, love and care. I may bump into things, toilet in the house, start barking at things that aren't there, stop and stare into space or simply want to sleep more - I'm not being difficult and I may not know that I'm doing all these things. Keep a watchful eye on my health and behaviour - if you're worried, take me to the vet. There are lots of things that can help elderly dogs from nutrition supplements through to exercise like hydrotherapy. Let me go with dignity and love. If you can, be with me at the end and hold my paw or cradle me until I have breathed my last. Know that I loved you, as you loved me and that, despite your breaking heart, you are doing the ultimate act of love. If your heart can stand it, open it again and allow another dog into your life. A heart like yours deserves to be filled with the love of many dogs. Provide them with the love and care you have shown me and when the time comes, we'll all meet again one day over rainbow bridge. So, in case you've missed it, our greyhound gang has a new member... Ava. ...however, firstly I needed to convince hubby and secondly, I wanted to make sure that the puppy (she wasn't named at that point) wasn't a nervous wreck and petrified of life in general. On the Friday, I casually mentioned about the availability of a greyhound puppy and I fully expected hubby to say a firm 'no, we're not ready.' Sometimes, however, fate can play a funny old role and instead of 'no', the answer was 'yes, let's go and see her' and so the scene was set. After several phone calls to Jenny and the then nameless pup's racing owner, we arranged to go and see her on Sunday 8th June. Stevie and Jasper joined us, as we made our way across the Pennines to meet the potential new member of our gang. Thankfully, the little black bundle of greyhound legginess we encountered wasn't fazed by me, hubby or Steve & Jasper. She took food from me, tried to solicit play (albeit unsuccessfully) from Jasper & Stevie and seemed pretty responsive. Her fate was sealed. She was coming home with us, then and there. Paper work was signed and we left with a slightly wriggly, extremely cute puppy. The journey home resulted in me and hubby agreeing on her name - Ava - and talking about how we were going to manage things back at home. All the time this was going on Ava slept - remaining completely unaware of the new life she was about to embark on. Stevie hums it & Ava sings it! Fast forward 5 weeks and our puppy isn't looking quite so puppy-ish. Ava's growing at an amazing rate of knots and seems to steal the hearts of everyone she meets. In the UK, you don't tend to see many greyhound puppies (most are born and remain within the racing industry until they retire), so she certainly gets her fair share of attention. Perhaps, more importantly, these past 5 weeks have highlighted to me just what hard work having a puppy is - especially if you want to get things right. It can be so easy to mess things up (albeit unwittingly) and, in doing so, create problems for the future. 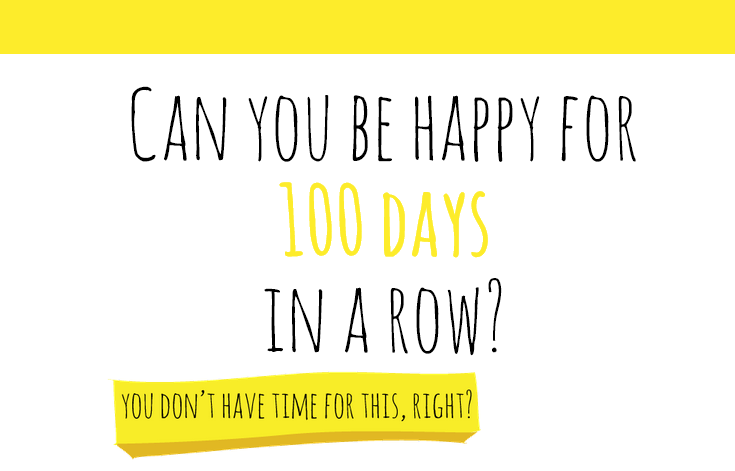 I want to make sure that this doesn't happen for Ava and that she gets the best shot at having a happy, healthy and balanced life where nothing really fazes her. My memories of Mina are still very clear - she came to me with established problem behaviours, many of which could have probably been avoided had she had the 'right start' in life. I do not want Ava to experience the fears that drove Mina to react to other dogs. I do not want her to have the fears that Jasper has - making him freeze in his tracks when he's afraid and I don't want her to feel like Stevie, who shakes, salivates and runs to hide when he hears loud noises, crashes and bangs and fireworks. 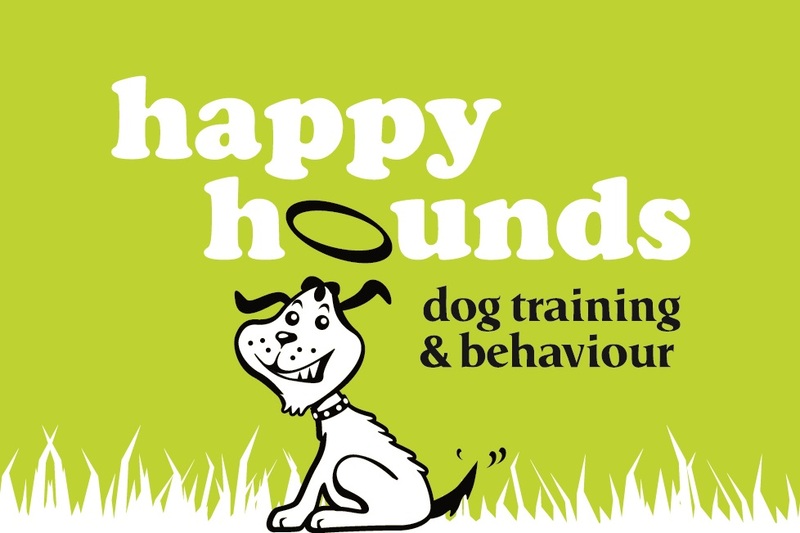 Like many trainers and behaviourists, I spend a lot of my time working with dogs that have behaviour problems - often borne out of a lack of early socialisation and the use of inappropriate and/or harsh training techniques. Most can be avoided if we give our puppies the right start in life. We need to educate our puppies how to live in our world and educate ourselves on how to achieve this. Ava is being educated and guided by me all the time. I manage her environment so she can't learn unwanted behaviours (I'll share details of this in another blog post), I make sure that her learning is positive and if she's worried or scared, I give her the space, distance and reduction in intensity that she needs - along with comfort and food reinforcers. I tell her 'yes' not 'no.' If she is behaving in a way I don't want her to, I'll interrupt the behaviour and divert her to another behaviour that I want to see. Say 'goodbye' to a tidy house - puppy toys rule! I provide her with outlets for her needs (our house looks like a bomb has hit it) - plenty of toys, chews, appropriate exercise - and I provide her with love and security. Nine years ago today, my life changed forever. 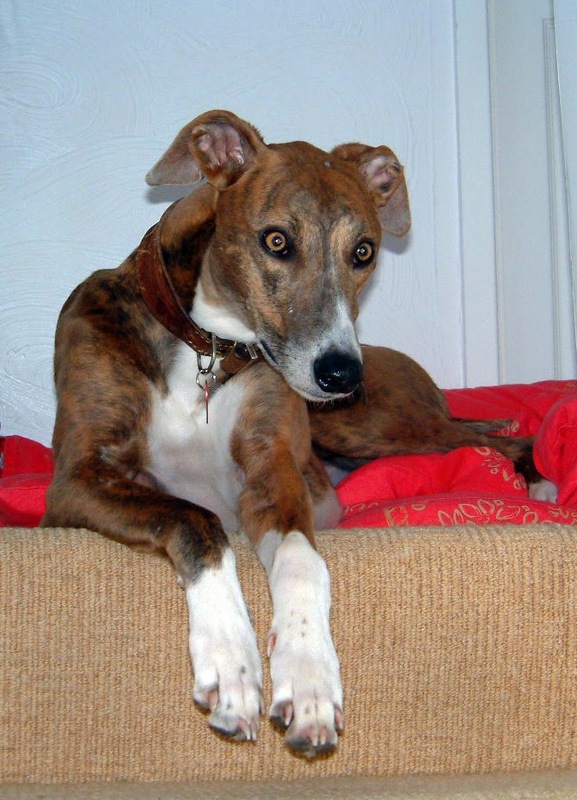 On 11 March 2005 our then family – me, hubby and two cats – were joined by Mina, greyhound. Fast forward nine years and, wow, what a difference a dog makes. It seems particularly apt to write about it now, nine years later, on what would have been Mina’s 9th ‘Gotcha Day’ and reflect on how ‘meeting Mina’ has changed my life. On 1 February 2014, Mina – my heart dog - passed away. Although her passing was planned and peaceful - she died at home, in my arms - it doesn’t make her death any easier to bear. I’ve spent the last month in an emotional fog, alternating between floods of tears and numbness. Mina was my first dog; she is the reason for this blog, the change in my career and for helping me find my true vocation. It’s fair to say her effect on my life has been profound and not something I could have ever envisaged just nine years ago. Everything is still very raw and, to be honest, it’s only now that I can start to put down in words what she meant to me and I want to share some of her story on my blog. If you’d asked me 10 years ago whether I’d have a dog, I would have laughed in your face. ‘A dog? Me? With my two cats? I don’t think so!’ However, fate has a funny way of entering your life and making you eat your words. And fate intervened in my life in March 2005. Something about the sign got me thinking. A few months earlier we’d been talking about dogs and somehow discovered that we both liked the look of greyhounds. Hubby had grown up with a dog (and a cat), whilst I’d grown up with rabbits and goldfish. I’d also been bitten in the stomach by a German Shepherd Dog in the 70s, but thanks to the Teflon like fibres of 70s synthetics, I was saved from serious injury. All in all, it was fair to say that I wasn’t a huge dog fan… but then again, there was just ‘something’ about that notice and was it fate that we’d been speaking about a greyhound and that a cat-friendly one was looking for a home? We decided that we’d contact Mina’s owner and see where it took us when we got back to the UK. 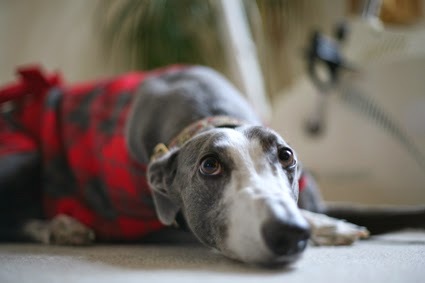 I still remember that first meeting at her previous owner’s house… A beautiful brindle greyhound, lying on her red duvet, looking at us with soulful eyes: it’s fair to say we were smitten and subject to introducing her to my cats – Chivers & Tazzie – our hearts had already been won over. The initial meeting between Mina and the cats went well and that was it – both Mina’s and my fate were sealed. I was to become a dog owner. 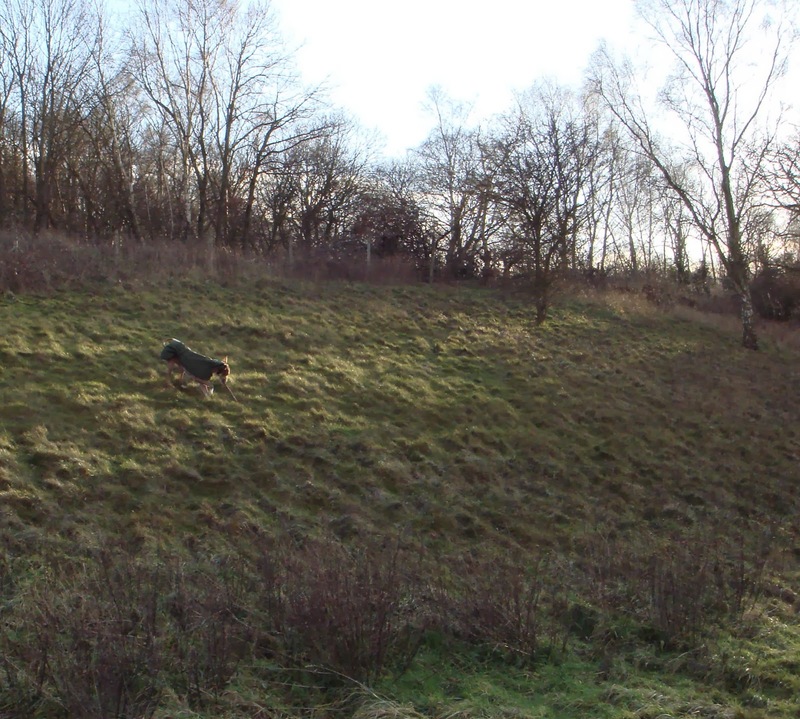 Mina was like a little billy goat on our walks, she would be up and down the escarpment in our local country park. Her off lead recall was great but her reactions to other dogs left something to be desired. Everything came to a head one week while I was away with work in London for a few days. I received a panicked phone call from hubby to say that Mina had attacked a standard poodle (both were off lead). I was devastated. My first thoughts were that we’d have to have her put to sleep. Then after a little more thought, I decided to take her to the vet to get her checked out and to see if there was an underlying cause – it was so out of character. (I must have had an inkling then, about what I do now – as medical conditions can sometimes impact on behaviour). The vet gave Mina a thorough examination and x-rayed her too. We discovered that she had poor bone density and that some of the discs had disappeared between her vertebrae, but apart from that she was healthy. We consulted a dog psychiatrist, and knowing what I know now, some of the advice wasn’t particularly helpful. I was that person who walked their dog at unsociable hours, afraid of meeting other dogs either on or off lead. 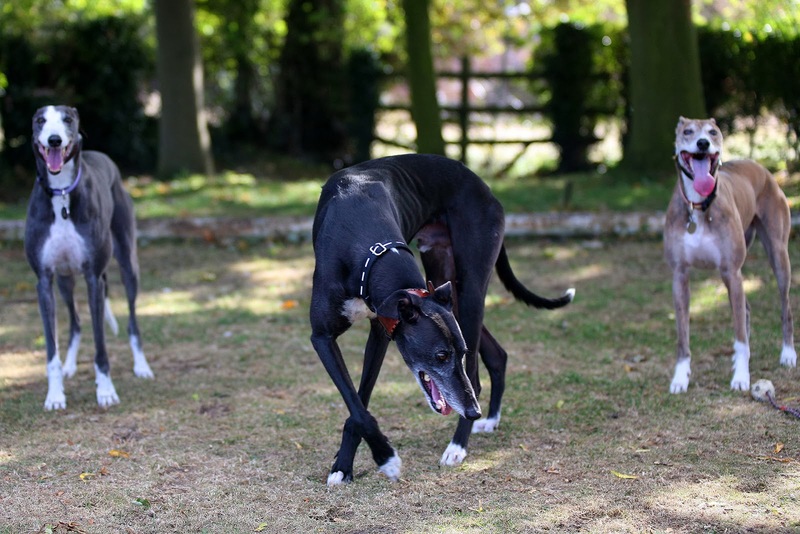 In 2007 we moved to Lincolnshire and it was by chance that I discovered a local greyhound charity – Lincolnshire Greyhound Trust. 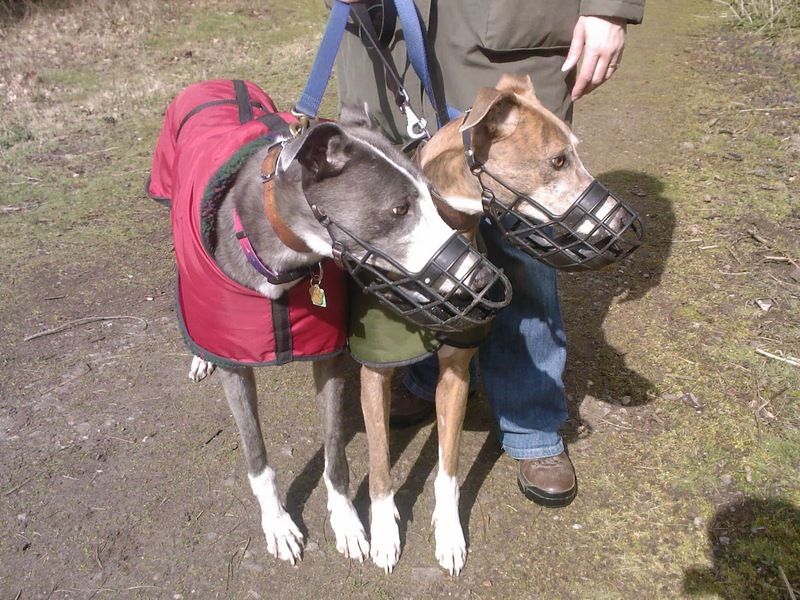 In early 2008, we went on a greyhound walk and found that Mina could get along with other dogs (mostly if they were greyhound shaped and weren’t rude in their greetings)! That’s when Stevie entered our lives and my greyhound obsession grew. 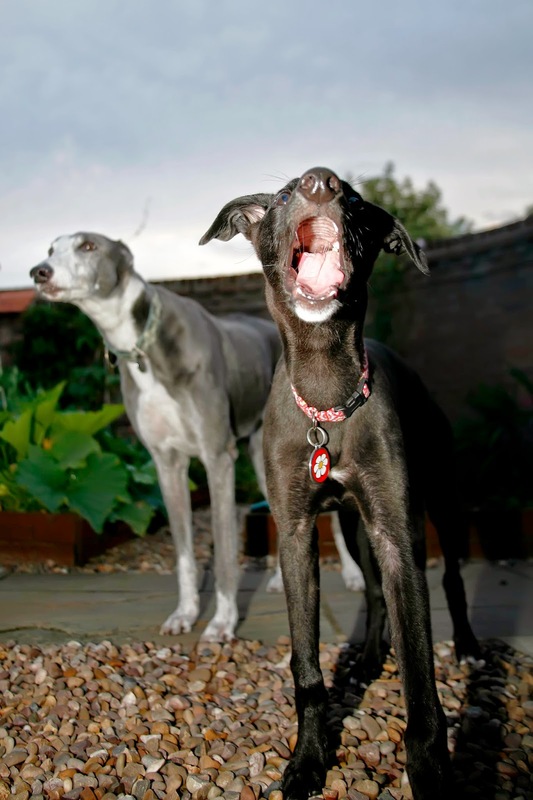 I still remember introducing Mina to potential greyhound house-mates (oh, how I would do things differently now). There was Figo, who was sooo excitable that he rushed right over to say hello, only to be resolutely told off by Mina, and then there was Stevie. Stevie was a handsome blue and white boy, cat trainable, amazing recall, a tad greedy, but more importantly Mina-compatible. Our greyhound gang now had 2 greyhounds. As well as some behaviour issues, we soon discovered that poor Mina had some medical issues too, which earned her the moniker of the ‘canine catastrophe’. I used to joke that Mina was the reason that pet insurance was invented (and you can read about my thoughts on why pet insurance is so vital here). Over her lifetime, Mina had many medical issues that required veterinary attention. Some were injuries due to living life to the full and others were more serious, due to genetics/illness. A conservative estimate of Mina’s total vet bills puts them around £20,000! She had two major eye operations, a toe amputation, torn muscles, split webbing, teeth extractions, regular eye check-ups with the specialist vet, leg and toe injuries; she also managed to cut her leg to expose the Achilles tendon and also cut her tail (half-way up), exposing another tendon. But do you know what? These conditions didn’t slow her down or dampen her joie de vivre. Whilst Mina was having one of her first ‘canine catastrophe’ moments, I fell in love with another greyhound. I was smitten. Jasper (or Magic, as he was known then) was a beautiful black hound, calm and serene – I likened him to being ‘my poochie prozac’. And, once Mina had recovered, he was introduced to her and completed our gang of three greyhounds. It’s fair to say that thanks to Mina, I discovered my true vocation. 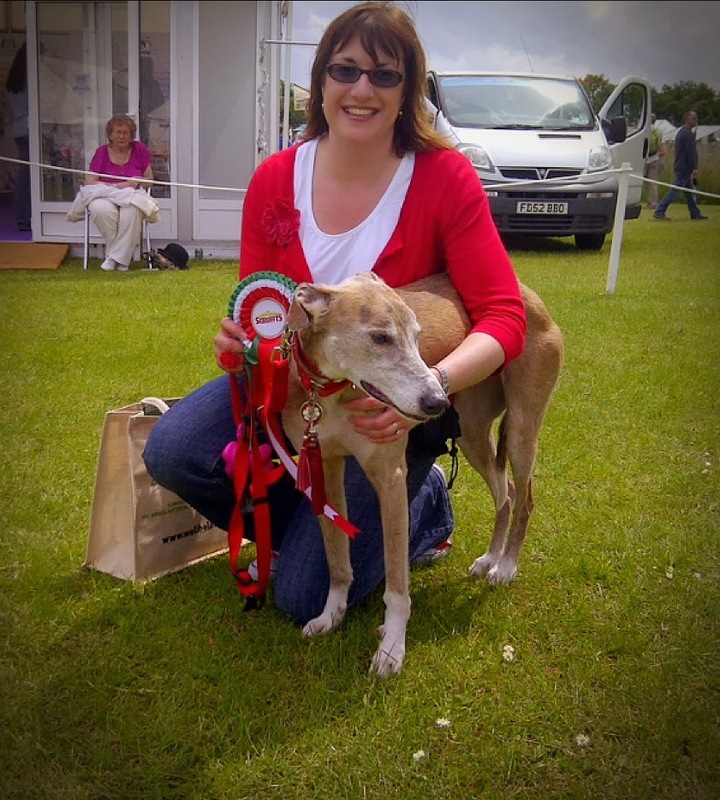 I never knew it, but I loved working with dogs and humans and as my appetite had been whet, I wanted to learn more about what made my hounds tick and how could I help them to adjust to life as a companion animal. Since meeting Mina, I’ve enrolled at university and completed my foundation degree in canine behaviour and training. I’m also continuing my university studies so that I can gain a BSc. 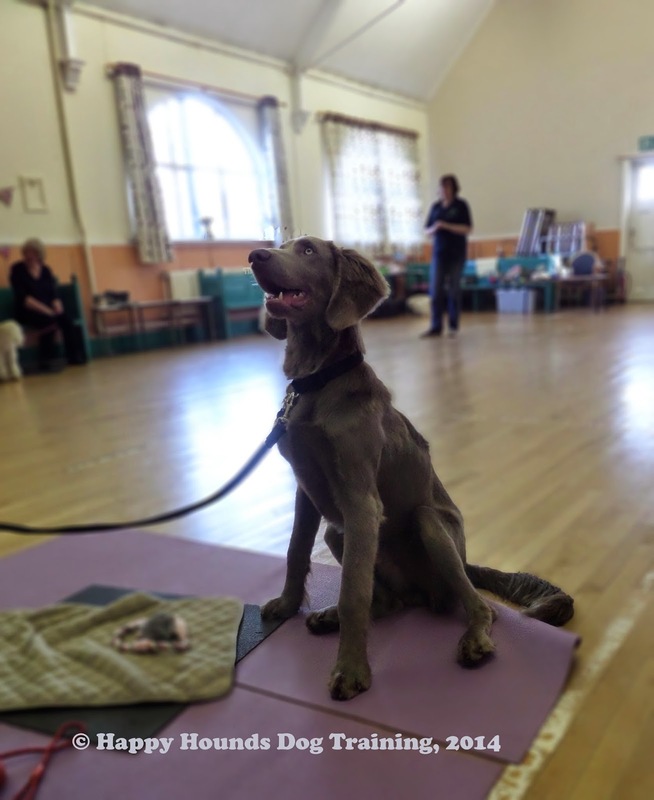 I became a Puppy School tutor – running puppy school classes under the UK Puppy School network. I firmly believe that many behaviour problems are preventable by good puppy classes and often wonder what Mina would have been like if she’d had that start in life. I used to joke that Mina hadn’t read the books that said greyhounds couldn’t do ‘x, y, or z’ - the word, ‘couldn’t’, didn’t seem to be in her vocabulary. 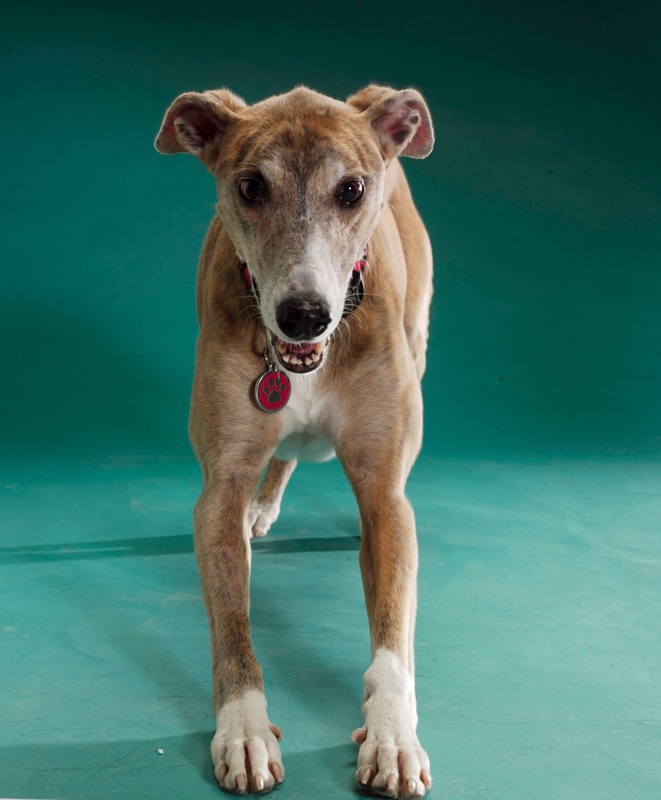 She took to trick training, agility and absolutely loved scentwork and loved to bust the myths surrounding greyhounds. One of Mina's biggest loves was scentwork, particularly Talking Dogs Scentwork. She took to it like a natural, sniffing out cheese wherever it was hidden. It's really thanks to scentwork that Mina and I became the team we were, as scentwork teaches you to 'trust in dog.' It was a great privilege and especially fitting that Mina was chosen as the calendar girl for February 2014. I still can’t believe that she’s gone. She has been my constant companion through the ups and downs of the last nine years. Don’t get me wrong, I love both Stevie and Jasper, but the bond I had with Mina can never be replaced. Grief is complex, and those who think ‘it’s just a dog’ have obviously never experienced the joy, love and companionship that living with a dog can bring to life. There’s not a day that goes past, without stirring a memory of Mina. I’m not sure whether time is a healer, but I hope, in time, that the pain of her loss lessens and that I can look at photos and videos without crying. I never expected to become a canine convert and could never have predicted the effect that one greyhound would have on my life. Thanks to Mina I have met some truly amazing people, who I’m proud to call friends; I’ve learned that patience and empathy go a long way (both with humans and hounds); I’ve launched a new career which, I hope, will see me through to my twilight years. She was the inspiration behind Happy Hounds Dog Training and all the humans and hounds I continue to work with will be her lasting legacy.